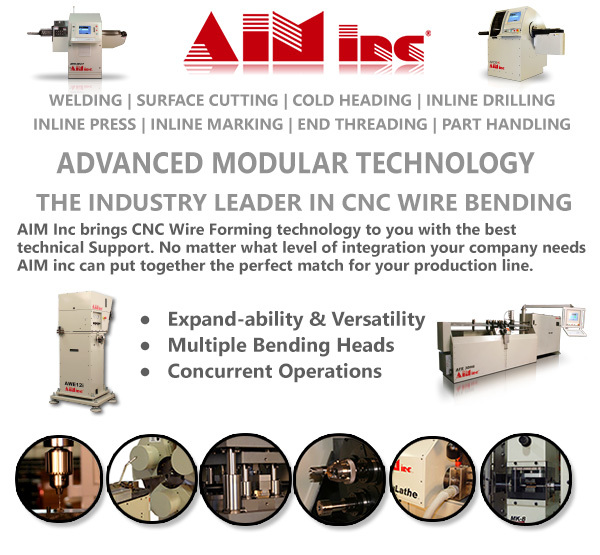 AIM Inc. - 2-D & 3-D CNC Bending Machinery & More! Aim Inc. offers 2-Dimensional & 3-Dimensional CNC Bending Machinery and More! We have over 1,000 machines installed, functioning day in and day out. 5 dedicated technicians that can be dispatched at any time or contacted at AIM. allows remote access to any machine anywhere in the world; diagnostics are completed in minutes. Must meet acceptance by you, the customer, or it never leaves our dock. - as long as you own the machine for AFM Models. See machine and part movements before you even make a part. No more guesswork! Can be setup to send an email to a predefined address in case of production start, production stop and machine error. The user can email their current working file to AIM Technical support personnel for immediate help. be pleased to explore solutions for your equipment needs.